Oen Hammonds gave an outstanding presentation at the recent AIGA/ACC event. Attendees listened attentively to Oen’s fascinating stories from his career and to his tips for soon-to-be VisCom grads. 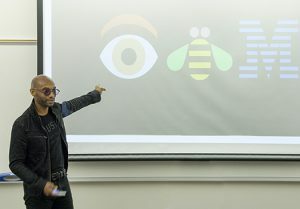 Oen is Advisory Designer for IBM Design. Outside his 9-to-5, Oen has taught as an adjunct instructor in VisCom, sharing his design experience and guiding portfolio students. He is currently president of AIGA Austin and he will discuss AIGA, the design industry, as well as provide advice to students and graduates who are getting started in the field with a Q&A session to follow. The American Institute of Graphic Arts (AIGA) is the oldest and largest professional design organization in America. AIGA/ACC, the student chapter at Austin Community College, was founded to create opportunities for students to get involved in the local design community and foster greater community among peers.